I used the same analytical procedure as I employed to examine 50-freestyle performances, by comparing the prelims and finals times for the 24 swimmers who made it back for one of the three heats of finals. Each swimmer appears from top to bottom, in rank order on their own horizontal line, with the first place finisher from finals on the top line. The blue square denotes the performance in the night swim (finals, consols, or bonus consols); the grey square denotes the performance in the morning prelims session. Unlike the 50 freestyle, where only four of 16 swimmers improved their time in the night session, here in the 400 IM, 13 of 24 swimmers improved during the night session. The phenomenon is probably not strange to most swimming coaches. The finals heats during the night session set up three new heats – or three new sets of races. Some swimmers improve, others swim slower… but what governs this process? The effects appear to be different in the final heat when compared to the consolation and bonus consolation heats. In the heat of finals (1st – 8th place), five swimmers improved on their times, two swam performances that were nearly identical to their prelim swim, and one swimmer was nearly one second slower in finals. 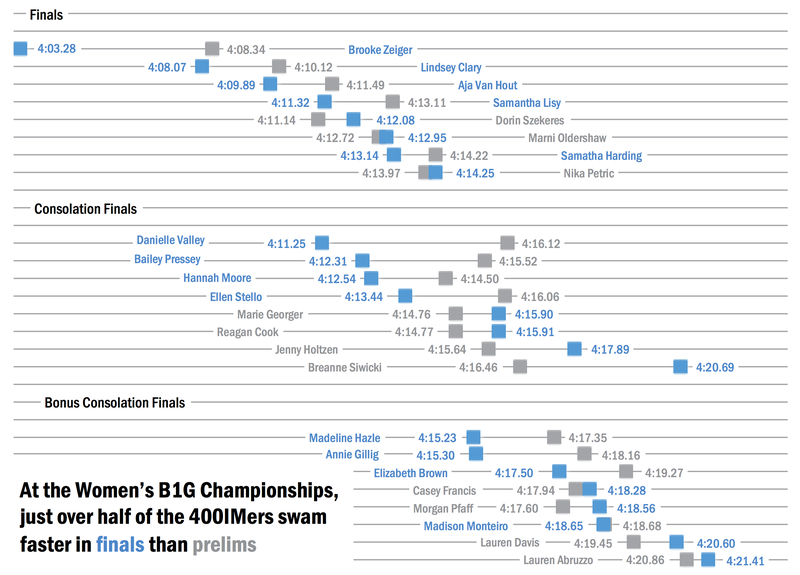 But the general picture is a leftward shift on the graph, and it gets more pronounced at the top, with the first place finisher (Brooke Zeiger of Minnesota) improving by over five seconds. That picture does not appear in the consolation or bonus consolation finals. In these heats, the grey squares representing the prelim swims are clustered roughly in the center, but the blue squares representing the finals swims are skewed in two directions. It appears that the top half of each heat is more likely to experience a time improvement, while the bottom half of finishers in the heat experience a slow-down. The effect is most remarkable in the consolation finals heat (9th – 16th place), where the top half of finishers all improved on their prelims swim, and the bottom half of finishers went slower than prelims. If prelim swims are an indicator of potential, then technically this should have been any swimmer’s race to win. All eight swimmers were within 2 seconds of each other after prelims (4:14.50 to 4:16.46), and in a long race like the 400 IM, a two second gap can be made up much more easily than in shorter races (like the 50 or 100 free). In fact, the winner of the consolation finals heat (Danielle Valley of Wisconsin) had the 15th place time in prelims. Valley’s improvement moved her up six places, earning nine points for her team (instead of the two points she would have earned had she stayed in 15th place). Usually, one swimmer says, “it’s mine,” and goes out and takes the win. Another says, “I’d be happy with second.” Another says, “third’s okay by me.” The decision is made before the race begins. These data, especially from the consolation heat, seem to suggest there might be some truth to that statement. In all fairness, the 400 IM is a difficult and exhausting event, and perhaps the performances at the night session have more to do with physical conditioning and recovery than they have to do with a swimmer’s conscious decision that she would go out and take the win. In addition, a swimmer might strategically hold back in one event, in order to save energy for another event later in the session. But the picture is stunningly clear – the swimmers, by virtue of their performances in prelims, are all within striking distance of winning the heat, yet not all swimmers appear to go after the win. One big caveat to this analysis is that this is only a descriptive analysis of performances. Theoretically, a swimmer’s performance should be limited by their seed-time coming into the meet; there is only so much time-improvement that a swimmer can experience in one season. A swimmer’s time in prelims probably correlates strongly with their season-best seed-time, but the relationship between the prelims time and the finals time is probably more complicated. To my knowledge, there is no hard-and-fast metric that determines how much time-improvement a swimmer should expect – that remains one of the mysteries of swimming. However, given the vast amount of swimming data (times) that exist in the public realm, it is certainly possible to devise a metric for expected time improvements. Possible, yes. But it also takes some of the fun out of the sport. As anyone who has ever coached swimming can attest, there is probably no thrill greater than a breakthrough performance, especially one that you’re not expecting.